The issue has started a debate between disability advocates and law enforcement that focuses on public safety and personal rights of the handicapped. While some states have vision requirements for gun ownership, Iowa does not. 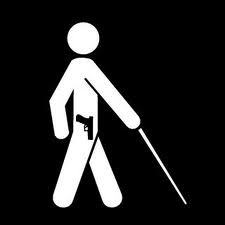 In addition, a gun permit law passed in 2010 opened the door to permitting the blind to carry guns in public. Delaware Sheriff John LeClere questions the wisdom of permitting someone to shoot at a target that cannot clearly see. “At what point do vision problems have a detrimental effect to fire a firearm? If you see nothing but a blurry mass in front of you, then I would say you probably shouldn’t be shooting something,” LeClere told Newsmax. Chris Danielsen, director of public relations for the National Federation of the Blind, does not think a vision issue should prohibit someone from carrying a gun in public. Why should those least able to defend themselves be deprived of the tools most effective for self defense? Children would fall into your category, along with a myriad of mentally ill people as well. Where is the rational line drawn? Along with the aforementioned individuals, blind people should probably not be pilots, or surgeons, or NASCAR drivers, or any kind of drivers at all, much less a concealed carry gun permit owner! It’s sad, but a blind person has to take responsibility for their malady and accept that they cannot have all the rights that they would want or need as a seeing person has, and adjust themselves accordingly as they have done all these years before this ludicrous law was passed. Subjectively, Iowa’s decision is the blind leading the blind. It just gets better and better, don’t it? Not really “justice” IMO, how about “blind faith”? Uh, how in the hell would the blind know if they’re endangering other people WHEN THEY CAN’T SEE THEM?! Therefore, how are the blind to know to use common sense in this respect?! H-E-L-L-O IOWA, ANYBODY HOME TODAY? What’s next, hunting licenses for the blind in Iowa? “Tom, NO, NO, that’s another hunters camp over there, stop…..! This is a no-brainer. Obviously they cannot be denies their Constitutional right. Arm them. Should they shoot at the “blurry mass” or “dangerous sound” and be incorrect, then the laws already established shall apply to them. This only means they must be EXTRA, EXTRA hesitant to pull their triggers. All legal firearm owners should know and understand this – and most do, thank God. Denying people their 2nd amendment right would be like denying someone with a speech impediments the right to speak (1st amendment). I assume driver’s licenses for the blind cannot be far off…. Way to go, Iowa! I’m pretty sure California already does. Have you driven the Cuesta Grade recently? We are absolutely on the same page here, ST. I receive email alerts for new articles/posts here @Cal Coast News, and the body of those mails are abbreviated. As such, when I read the email alert on the subject — and before I logged in here to read the whole article — I *NATURALLY* assumed that it was the geniuses running the State of California who had approved weapons permits for the blind. But hey, look on the bright side… we’ve so much to look forward to! Now that Iowa has established a precedence on the issue, the Movers & Shakers up in Sac’to will see the wisdom and follow suit in short order.